In turn, as the implementation of AI becomes more mainstream, general public concerns have started to pile up. There is an increased demand for clarity on how and what consumer information or data is being collected and used by businesses. Not only that, consumers want to gain further insight into how AI models and algorithms really work - the need for visibility on what's under the lid of the algorithmic black box that is AI is at an all-time high. Implications of AI are more advanced, complex and serious than ever before. In particular, when we start looking into aspects of AI like deep learning and neural networks which are notoriously opaque. Designed to operate like human neurons, neural networks process a large number of inputs and outputs, adjusting the way they process inputted information, converting it into “knowledge” and essentially creating outputs that would be too difficult for humans to manually code. It is often referred to as Black Box AI and implies that we understand what is inputted and outputted but don't necessarily understand what goes on inside in order to produce the outcome. This is a cause of concern for businesses, consumers and governments alike - contributing to the vast need for transparency. Even more so when we start relying on AI for critical decision making, take AI-assisted medical care or AI-driven vehicles for instance, people would certainly not accept a medical decision made by AI before having clear reasoning as to how it reached that particular conclusion. Not only that, but for the conclusion to be credible, it would probably need to presented in an understandable way and via a human context. What's being done to combat the black box? Organisations are not oblivious to this and concrete actions are being taken to combat the general worry and reluctance towards AI. A perfect example is Open AI, a non-profit organisation established by none other than Tesla's Elon Musk, which aims to make research and development of AI available to everyone and anyone. The organisation's main goal is to advance digital intelligence that will benefit humanity as a whole rather than focusing on generating financial return. Google, Microsoft and IBM have also joined forces by founding Partnership AI, which raises awareness on the bias and ethics surrounding AI. One of their main goals is to establish and advance public understanding. With experts across all disciplines and industry sectors, they provide guidance on emerging issues and support the research, development and use of AI. What's more, there is global movement within AI development called Explainable AI (xAI), that came about with the aim of making AI interpretable. It is a model of development that makes AI-powered decisions easily understandable by explaining, in simple terms, how the AI has reached a particular conclusion. Their main goal is to ensure ethical practice and avoid manipulation and bias within AI development. The challenge with transparency for businesses using commercial AI is that very rarely do they want to share their all-important source codes. Keeping proprietary information safe and perhaps even secret is often a top priority, especially in the current competitive market. Not to mention, making source code transparent isn't straightforward - machine learning algorithms can often be built on hundreds of lines of code involving masses of data, which would most likely not be understandable to the average person. And perhaps making the back-end interpretable to consumers isn't necessary in the case of commercial AI, especially when it’s seamlessly integrated into our daily lives - AI that provides the right content at the right time is no longer being questioned and funnily enough, we might actually expect or even feel entitled to be provided with very personalised content specific to our needs at that particular moment in time. Moreover, consumers have realised that there are benefits to providing companies with their data - In a survey by Deloitte and SSI, 79% of respondents said they would be willing to give-up more information to companies if there was a clear benefit for them doing so. That's why, when it comes to commercial AI, emphasis on transparency moves more towards data privacy and being open about consumer data collected. Obviously, we couldn't talk about data protection without mentioning GDPR. With it in effect, legislation requires businesses to be open about the data their websites are tracking. In fact, even prior to the regulations set in May, transparency was already a requirement in the existing EU Data Protection Directive. 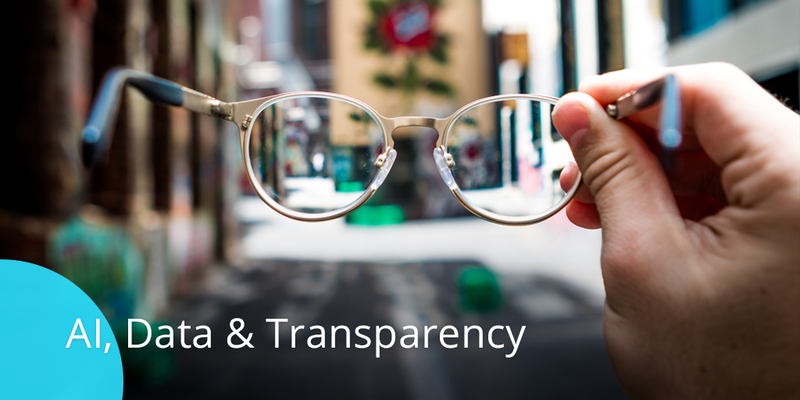 GDPR has just strengthened the implementation of transparency. In a nutshell (and avoiding repetition because we know you've probably already heard it before), the regulation highlights the right to explanation which protects users and mandates that they have the right to demand the data behind algorithms and decisions that it makes for them. The regulation protects users and their information, in turn creating an environment of transparency. If you've read our previous blog post “how to get started with AI - as told by our AI expert”, you will know that data is a key factor in AI. In order for it to successfully work, it needs a fair bit of data to reach a point of being able to deliver sufficient results and to build the machine learning model. Most commercial AI collects anonymous usage data for troubleshooting, profiling, statistics and service improvement purposes. So the data collected is very much generic, does not link to any personal information and cannot be connected to any individual’s data. Our AI, giosg Target, is strictly limited to collecting data on the following information: operating system, device, browser type, visited URLs, and timestamp. Eventually, at some point in the future, when Artificial General Intelligence (AI that is at the same level of intelligence as the human brain) is achieved, the lid of the black box will become more difficult to lift. But for now, there is no need to worry- with the ever-growing buzz around AI and transparency, there's no doubt that the emphasis on the open development of AI will only continue to grow, fuelled not only by customer fears and concerns but also by the businesses investing in it. Looking for more information about AI and how it could be used? Read our whitepaper to find out more: Demystifying AI - The basics of artificial intelligence and a simple guide to getting started.